Our standard frame width fits most desktops, but if you have a top less than 43" wide, we recommend choosing the narrow frame. Pick your frame width to fit the desktop you'll be pairing it with. We find that the standard frame width, which telescopes to fit desktops anywhere from 43" to 96" wide, works ideally for most users. If your desktop is narrower than 43", we offer shorter crossbar ends that will fit tops as narrow as 26". The standard width frame comes with optional removable center rails if you want the option to mount a longer keyboard tray track. Please note: All dimensions given are assuming desktop is at least 1" thick and made of a durable material. Powerful, reliable, and endlessly versatile, the UPLIFT V2 Standing Desk Frame allows you to rise to the level of the work you do. Named the "Best Standing Desk" by Wirecutter, our designers made this frame even sturdier and more adaptable than before, letting you do more with your desk than you ever thought possible. This steel frame, sealed with a powder-coat finish, allows you to supply your own desktop—you can use an old door or rip the top off your current desk. And it comes with exciting new features you won't find anywhere else. 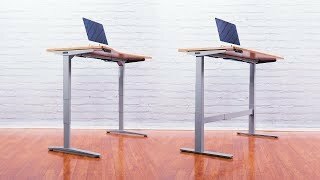 Whether you choose the UPLIFT V2 Frame or the UPLIFT V2 Commercial Frame, know that you're getting the most advanced sit-stand desk available. Click here to see the contrast between the two frames. If you're interested in a full desk, check out our UPLIFT V2 Standing Desk. And if you're looking for a completely different setup, try our UPLIFT V2 L-Shaped Standing Desk Frame or our UPLIFT V2 4-Leg Standing Desk Frame. We offer you two options when it comes to our new frame: the UPLIFT V2 Frame and the UPLIFT V2 Commercial Frame. Click here to quickly learn more about the differences between these frames. Starting with the UPLIFT V2 Frame, which has a height range of 25.5" - 51.1" (with a 1" desktop installed), this frame is remarkably sturdy, shockingly quiet, and stunningly smart, with advanced anti-collision features. That's probably why it was selected as the Best Standing Desk by Wirecutter! By contrast, our UPLIFT V2 Commercial Frame has a lower minimum height of 22.6", with a 1" desktop installed. It also has a larger overall height-adjustment range when you compare it to the UPLIFT V2 Frame. It meets the ANSI/BIFMA G1-2013 height standard, while still complying with the ANSI/BIFMA durability standard. Our UPLIFT V2 Commercial Frame also supports ergonomic working postures for 5th percentile females through 95th percentile males, in seated and standing positions. Look underneath your UPLIFT V2 Frame and you'll see four dozen independent, patent-pending mounting points to utilize with a growing collection of desk accessories. Discreetly hidden, this system lets you use your desk in new ways. We have an under-desk hammock, for when you feel like changing your posture from seated to standing to supine (and it’s available now)! We have many frame-attached accessories that will soon be released, including desk extensions, CPU holders, and power strips (as pictured below the hammock). Please note: the hammock is only compatible with the UPLIFT V2 Frame. It’s not compatible with the UPLIFT V2 Commercial Frame due to its interference with the stability crossbar. Work with easy, one-touch adjustments on four programmable memory buttons, which let you move from sitting to standing quickly, just by selecting your preferred preset. Press a button when you're ready to switch work postures and you'll have the perfect amount of time to move your chair. Advanced safety features keep your desk safe. Anti-collision sensitivity and a keypad child lock allow you to work with peace of mind, knowing your desk will only adjust when you want it to. In the chance that it does come into contact with objects or people, it is smart enough to know to stop. The frame's maximum and minimum heights are also adjustable. That means you can set upper and lower height limits, preventing your desktop from knocking into shelves above, or file cabinets below, ever again. An auto-dark LED display reduces distractions and helps you concentrate in your workspace, dimming the keypad screen 10 seconds after you use it. From the bottom of our hearts, we want to tell you, our customer: thank you for your support. We heard you, and created UPLIFT Desk based on your feedback. Since the beginning, it's been our mission to help every person and every office build the spaces that let them do their best work. That's why we are dedicated to keeping our prices as low as possible, while holding our quality to the highest standards, making it easier for you to create your space for less. As we grow, we're able to help more and more people work better and live healthier, and that's due in large part to you, our customers—and to the support you've given us over the years. Thank you. We're proud to be named the "Best Standing Desk" by both Wirecutter and Forbes—and ranked #1 by Wired, Lifehacker, and many others. Join our hundreds of thousands of contented customers, including hundreds of Fortune 500 companies. Give your workstation and all of your devices the power they require with power options from UPLIFT Desk. We make solutions for every setup: power grommets, surge protectors, clamp-on power units—you name it. We have what your desk needs to help you stay charging and perfectly powered at all times. The right wire management can be easy to overlook, but if your new desk has a tangle of cords underneath, it's pretty hard to ignore. Organize, store, and shelter your cords with our comprehensive collection of cable management tools. We offer a wide range of wire management solutions to meet your needs, while also making your new desk look great. Sit and stand at your desk knowing that your cords are protected and tucked away, safe from snagging or being pulled out of the wall. Your UPLIFT V2 Standing Desk Frame will even come with a wire management tray to get you started. If you're planning on furnishing an office with four or more desks, we would like to offer you our complimentary space planning layout services. Our design team will help get the ball rolling on your custom office layout. All you have to do is complete four simple steps, and we'll configure your office desk space for free, no strings attached. With your layout, you'll also receive a discounted quote for your order, making your dreams even more affordable to achieve. What kind of top can I attach to this frame? We recommend attaching a desktop that is at least 3/4" to 1" thick and 42" to 80" wide. Your desktop will also need to be compatible with wood screws, which are used to connect the frame to the desktop. Wooden, laminate, or other sturdy composite materials make for great desktops. Can I use this on a circular top? Go for it! Just make sure your top is at least 3/4" - 1" thick and is centered on the frame. Can I put a glass top on this? We do not recommend installing a glass top on the UPLIFT V2 Standing Desk Frame, as you will not be able to adequately secure the glass top to the frame.